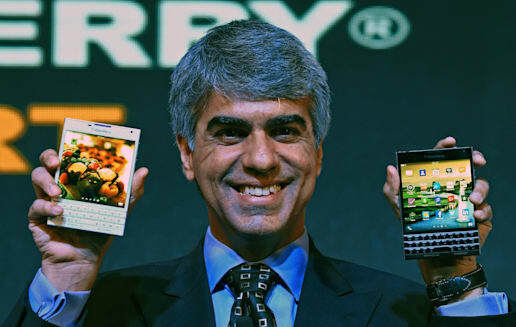 Sajjad Hussain/AFP/Getty ImagesBlackBerry executive Sunil Lalvani shows off the new Passport. A new smartphone was launched on the market to much fanfare recently. It promised a host of new features, came in a new size and was powered by the freshest version of its company's operating system. No, we're not talking Apple's (AAPL) bulked-up iPhone 6 line. This device is the Passport, the brainchild of BlackBerry (BBRY), a company seemingly back from the dead. In its heyday, BlackBerry (then known as Research in Motion; last year the company renamed itself for its signature product) was the portable communications hardware to own. The original BlackBerrys were basically glorified pagers, with wide displays and tiny keyboards, which allowed users to access and send email. Though it's a rather commonplace feature on phones these days, back in the late 1990s and early 2000s, easy-to-use portable email was a revolutionary concept. But in mobile communications, innovation moves fast, and companies that remain relatively static can quickly get left behind. Similar to Nokia (NOK) and its antiquated Symbian operating system, Research in Motion relied too heavily on the core appeal of its software. Technology moved on; once the iPhone hit the market in 2007, and Android followed, there was little chance of success for manufacturers who weren't playing the latest version of the smartphone game. Email had become just another app among many. Starting early this decade, BlackBerry's results started to slide. Revenue dropped from just under $20 billion in fiscal 2011 to $11 billion only two years later, to nearly $7 billion for 2014. The bottom line plunged into the red to the tune of $646 million in fiscal 2013, and a scary $5.9 billion the following year. Meanwhile, Apple and a determined Samsung (SSNLF) rose to the top of the heap with their feature-heavy phones. According to technology research firm IDC, in the second quarter of this year Samsung stood at the peak with a nearly 25 percent share of the market, with No. 2 Apple taking 12 percent. BlackBerry didn't even crack the list of top five manufacturers. So expectations weren't particularly high last month when BlackBerry launched the Passport, its first new piece of hardware in almost two years. Reviews have generally been positive and complimentary. According to company CEO John Chen, it sold out on BlackBerry.com within six hours of introduction, and inventory has been depleted several times since then. BlackBerry sold around 200,000 Passports on the first day of the device's launch, certainly not iPhone-level numbers, but respectable nevertheless. Besides, massive volume isn't the goal. Realizing that its offerings can't really compete with snazzy iPhones and Samsung Galaxys, BlackBerry decided to abandon the consumer market altogether and concentrate on the corporate segment. This is a very sensible move, as its offerings were always geared more toward productivity -- answer work emails instantly, on the go! -- than game playing or social media status updating. One big selling point of the Passport is its sizable square viewscreen, which has more real estate and can display more text per line than many rivals -- all the better for a professional to work on a spreadsheet, for example, or review an X-ray. Outside of the hardware sphere, BlackBerry has other initiatives it hopes will help lift the company back into profitability and prominence. The company has become leaner thanks to an aggressive cost-cutting campaign that's seen it sell off assets such as real estate. It also recently closed the book on a workforce reduction program, slimming headcount by around 60 percent over the past three years. In addition, it's made efforts to boost its revenue from services and software. The former, which includes offerings linked to its popular Messenger software, was the top revenue source (at $424 million) in the company's most recently reported quarter. As for software, BlackBerry hopes to double revenue from the segment next year. All things considered, though, the company still has a fair distance to go. In its most recently reported quarter, it posted $916 million in revenue. That's well under the $950 million analysts were expecting. And although its net loss was narrower than market projections (2 cents per share vs. 6), it was still a shortfall. Yet the company has believers on the market. They've bid up the stock over the course of this year, lifting it by nearly 40 percent to over $10 per share. They are, of course, hoping for a comeback story -- a passport to renewed success, if you will. Motley Fool contributor Eric Volkman has no position in any stocks mentioned. The Motley Fool recommends and owns shares of Apple. Try any of our Foolish newsletter services free for 30 days. Check out our free report on the Apple Watch to learn where the real money is to be made for early investors.